All baseball fans know that you can’t read too much into spring training performance. That’s good news for the Mets right now, because Mike Pelfrey just allowed 8 runs in 2.2 innings as the Mets lost 9-5 to Houston for their ninth straight spring training loss. The enigmatic Pelf allowed 8 hits and 4 walks while striking out 4 Astros. On offense for New York, Rob Johnson and Ronny Cedeno both hit home runs. After the game, Pelfrey discussed his performance. The big righty is right about his past spring training performances. 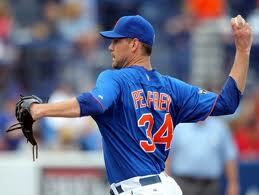 In 2010, Pelfrey pitched 26.1 innings for a 6.15 ERA and 8 home runs allowed. In 2011, he threw 24 innings with only 1 home run allowed. This year, he’s got a 14.90 ERA and 4 home runs allowed in only 9.2 innings.I don’t think the spring training numbers matter that much. Pelfrey is essentially getting himself warmed up for the regular season. I don’t think he’s thinking as much about getting specific hitters out as he would during the regular season, but even if he is, there’s nothing to suggest that Pelfrey being especially poor this March will lead to a really bad regular season from him. I’m worried about Pelfrey, but it’s because he’s 28 years old and hasn’t developed a very good secondary pitch; not because he can’t get anyone out in spring training. The off -the-field nightmare appears to be over, and not we are just stuck with the on-field one. According to the settlement, the Wilpons owe investors just $162 million and none if it is due in the next three years. Also, Adam Rubin is reporting that the Wilpons as victims of the ponzi scheme could be due around $90 million, so they would only net about a $72 million loss. The suit Iriving Picard brought against the Wilpons was originally seeking $386 million, so this settlement is considered a big win for the Mets. It’s a big win for fans too, because we won’t have to suffer through an elongated trial process all year. Those folks who wanted the Wilpons to sell the team, however, are out of luck for now. Tim Byrdak, according to the New York Daily News, is a long shot to be ready for Opening Day. 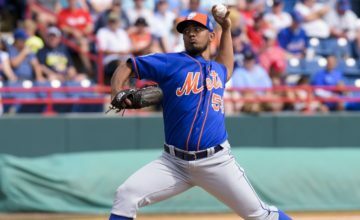 Which lefty will be in the Mets bullpen when the season starts in earnest? Amazingly, 2010 30th round pick Josh Edgin is still in the running, but the favorites remain Garrett Olson and Chuck James. Andy Martino says my favorite guy Daniel Herrera and minor league starter Robert Caron are not being considered. C.J. Nitkowski is still not a Met, so between Olson and James, I guess I’d rather have Olson, just because he’s a little younger and he’s at least been in the major leagues for parts of the past three seasons. James just returned to the majors for a “cup of coffee” with Minnesota after a two-year absence.